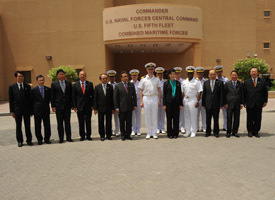 Yingluck Shinawatra, Prime Minister of Thailand, visited Combined Maritime Forces (CMF) headquarters, Bahrain, May 15. Commodore Simon Ancona, Royal Navy, deputy commander, Combined Maritime Forces and Rear Adm. Kevin Scott, deputy commander, U.S. Naval Forces Central Command meet Yingluck Shinawatra, Prime Minister of Thailand, and her delegation during her tour of the Gulf region. Commodore Simon Ancona, Royal Navy, deputy commander, Combined Maritime Forces, and Rear Adm. Kevin Scott, deputy commander, U.S. Naval Forces Central Command, welcomed Prime Minister Shinawatra to CMF. Shinawatra is touring the Gulf region and will visit Qatar after departing Bahrain. Commodore Simon Ancona, Royal Navy, deputy commander, Combined Maritime Forces and Rear Adm. Kevin Scott, deputy commander, U.S. Naval Forces Central Command meet Yingluck Shinawatra, Prime Minister of Thailand. Shinawatra was presented briefs about CMF’s mission and achievements, and discussed the Royal Thai Navy’s contribution to CMF, as well as their current command of Combined Task Force (CTF) 151 (counter-piracy). “The Combined Maritime Forces mission is important from both a national and international perspective. Continuing to develop our collaborative and interoperable Maritime Security role in the region remains crucial,” said Commodore Ancona. In 2010, Thailand became the 25th member of Combined Maritime Forces, a 26 nation naval coalition. Combined Maritime Forces is a multi-national naval partnership, which exists to promote security, stability and prosperity across approximately 2.5 million square miles of international waters in the Middle East, which encompass some of the world’s most important shipping lanes. Yingluck Shinawatra, Prime Minister of Thailand, met with Combined Task Force (CTF) 151’s shore based team.